We had a wonderful interview with Erin Norris of (614) magazine a month ago–and she turned it into a wonderful article on “The Year My Dad Went Bald.” Erin profiled the book as part of the magazine’s Charity Profile–what a great idea to spotlight organizations that give back. We are just honored she felt we were worthy of being included. 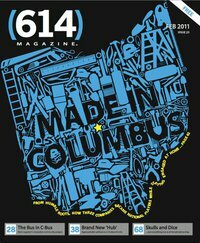 (614) is a terrific magazine for everyone in Columbus to stay connected to the city, and it is an honor to be part of it! Hope you will check the magazine out on Facebook, on the web and at news stands around the city.